In today’s tech-heavy world, there are household names in every arena. For example, in social media, you have Facebook (NSDQ: FB), in online search, you have Alphabet (NSDQ: GOOGL), and in smartphones, you have Apple (NSDQ: AAPL). But there’s an area that you may not hear much about but is ubiquitous in the modern world: networking. Indeed, without networking technology, you would not be reading this article. You would not even be able to be on the internet, which is essentially a massive network of networks. There, in networking, the king is Cisco Systems (NSDQ: CSCO). A married couple, both Stanford University computer scientists, founded Cisco Systems in late 1984. They realized that the technology Stanford used to connect two local computer networks could be adapted for large scale use. In other words, they wanted to be able connect larger computer networks separated by greater distances. They licensed the software from Stanford and based their first products on this technology. The 1990s saw the beginning of the explosive growth of the Internet. Cisco was able to ride the wave by providing a bunch of products vital to Internet service providers. 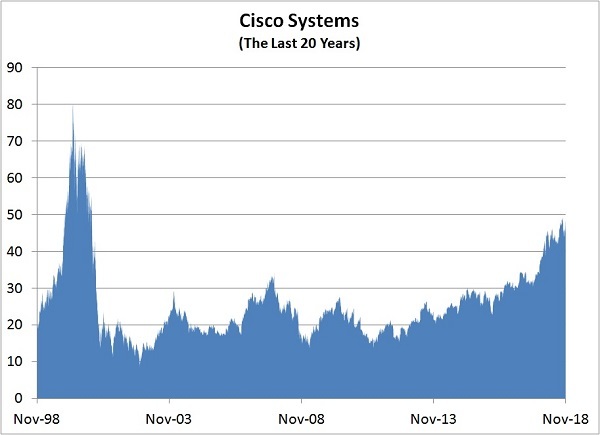 During the dot-com bubble, Cisco was once the most valuable company in the world. Today, Cisco is a mature tech company. It no longer grows as fast as it once did. It’s also not as dominant as it once was. Still, it is one of the largest tech companies in the world. 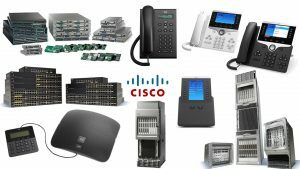 Cisco sells products like switches, routers, firewalls, and other networking products. To generate more recurring revenue, the company is also focusing on software and services to complement its hardware offerings. Everything you need to set up and maintain a network, Cisco can supply it. Cisco is an ecosystem on its own. Customers face a high switching cost if they want to switch to a different vendor because Cisco’s products are so entrenched in networks. A network disruption could have very serious consequences for companies, so they usually aren’t eager to take that risk. How Has Cisco Stock Performed? What Is Cisco Stock History? At the peak of its glory, Cisco briefly traded in the neighborhood of $80, before the dotcom bubble burst. It sank below $10 at one point in the fall of 2002. It then traded sideways for a few years between the high teens to the low $20s. Since then, the stock has made its way back above $40. Until the last several quarters, in recent years growth had hit a snag due to the emergence of cloud computing. The growing popularity of storing data in remote locations meant that customers didn’t need to spend as much on “on-premise” IT equipment or run their own infrastructure. In other words, demand for Cisco’s traditional products had decreased. CSCO definitely hasn’t come anywhere close to the runs made by the FAANG stocks. However, the company is a steady revenue and cash flow generator—it generates about $10 billion a year in cash flow. It makes up for lackluster sales or profit growth with a growing dividend. Over the past five years, Cisco has increased its dividend at a clip in the mid teens. How Has Cisco Performed In 2017/2018? Although CSCO hasn’t matched the other tech high-fliers, its last two years haven’t been shabby at all. The stock comfortably beat the S&P 500 in 2017 and should be able to beat the index once again this year. The company’s growth has accelerated in recent quarters, attracting investors. Since taking the helm in 2015, CEO Chuck Robbins has refocused on its core business of networking and on recurring revenue on its software business. The company’s cyber security business, although small compared to the rest of the company, has become its fastest growing unit. Cisco’s recent purchase of Duo Security for $2.35 billion adds to its security capabilities. Cisco’s main competitor over the years, Juniper also sells networking hardware and software like routers, switches, firewalls and related software. Cisco offers a more comprehensive portfolio of products and services. Not counting the computers themselves, anything you need for a network you can get from Cisco; not the case with Juniper. 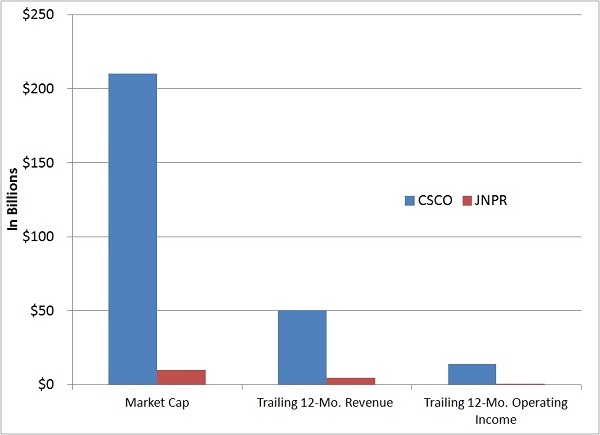 With a market cap close to $10 billion, Juniper is far smaller than Cisco ($200 billion-plus). It has given Cisco a good fight over the years but it won’t topple Cisco. For example, in the routers market, Cisco has about 50% market share; Juniper has about 16%. Spun off from HP (NYSE: HPQ) in 2015, HPE focuses on servers, storage, networking, consulting and support. HPE is the top seller of data centers servers but Cisco has the lead in other main categories of enterprise infrastructure spending. In recent years, the rise of cloud computing has shrank the market for traditional data center servers, but given HPE’s greater reliance on that segment of the enterprise infrastructure market, that’s a bigger knock to HPE than Cisco. Just like Juniper, HPE is still fighting, but Cisco is still has the lion’s share of almost all of the markets in which it competes. Symantec is one of the largest dedicated cyber security companies in the world. Here, it is Cisco who’s trying to challenge the incumbent. As the tech world evolves and 5G looms, with the good comes the bad. The more connected the world becomes, the more convenient our lives will be, but cyber criminals will also get more opportunities. This creates great opportunities for cyber security companies. Because of all the different types of threats there are, it’s a great challenge to stay ahead of hackers and to be able to detect and block intrusions. According to this user review, Cisco’s endpoint protection platform actually edges out Symantec’s competing platform. Furthermore, the sales growth in Cisco’s security business is concrete proof that it is becoming a serious player in the area. 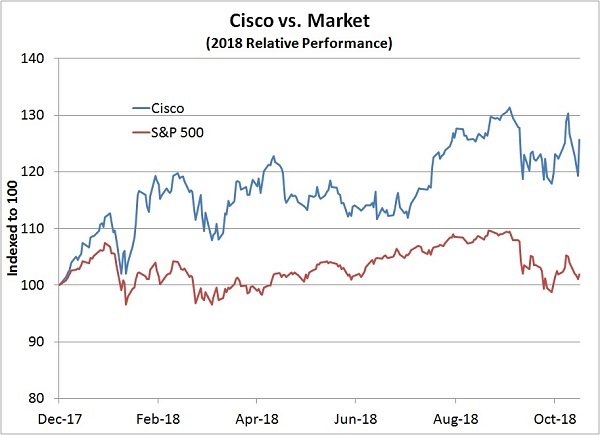 Will Cisco Go Up In 2019 (Should You Buy)? The company just reported its fiscal 2019 first-quarter results last week. Revenue was a company quarterly record of $13.1 billion. Earnings per share were $0.75. Both were above consensus expectations and represented year-over-year growth of 7.7% and 23.0% respectively. This marks the fourth-consecutive quarter of accelerating revenue growth. Revenue was up across all its geographical segments and the international markets were up double digits. Growth was also broad across its various business segments. The company also provided a strong guidance for 2019. Under Robbins’ leadership, Cisco seems to be doing the right things. With 5G on the way, which will enable faster and more reliable connectivity, there will be new world of opportunities. 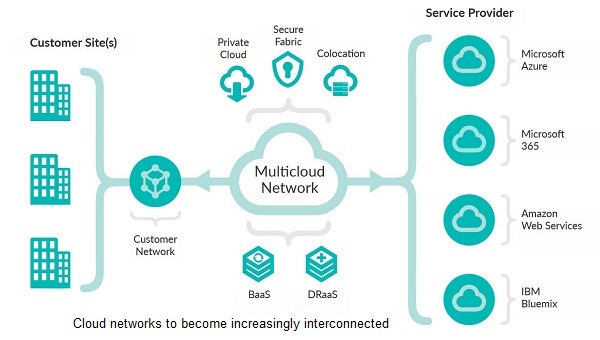 Cisco has partnerships with major public cloud providers such as Amazon (NSDQ: AMZN), Alphabet and Microsoft (NSDQ: MSFT) and looks to position itself as a key player as cloud computing evolves to become more connected. Customer preference has changed. Increasingly, enabled by cloud computing, instead of owning hardware, they want to consume software on demand because it doesn’t require a laborious set up and it is cheaper and more flexible. As a result, Cisco has greatly expanded its software offerings and it is shifting toward selling subscription-based hardware and software. These adjustments should help margins and ensure even steadier revenue and cash flow. There is no doubt Cisco is heading into 2019 with momentum. 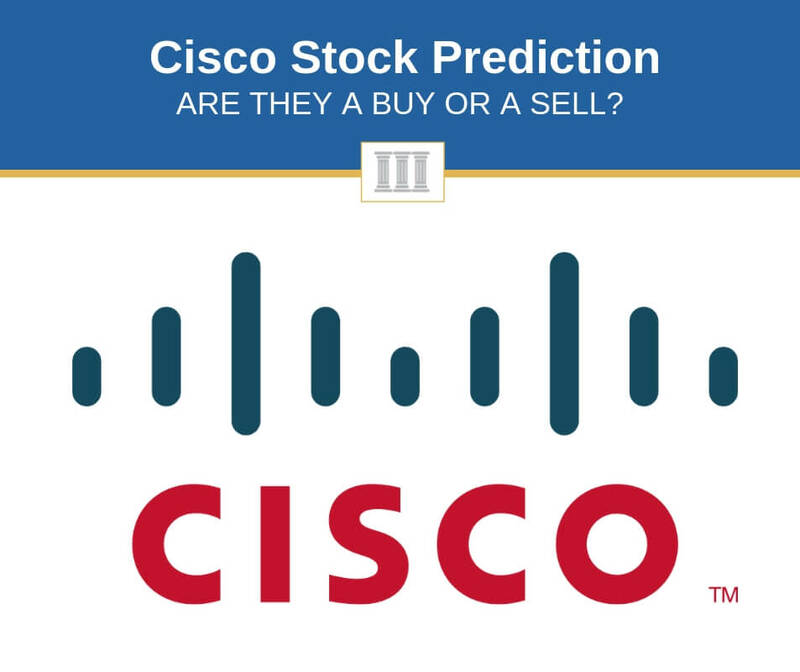 Will Cisco Go Down In 2019 (Should You Sell)? Operators of public clouds like Amazon favor the so-called “white boxes.” These are generic switches that run on open-source software. They are alternatives to hardware that Cisco and other brands sell. There are rumors that Amazon is considering selling its own white boxes to business consumers. Cisco recognizes the white-box threat. Former Cisco John Chambers predicted a few years ago that these white boxes would be Cisco’s greatest competitor, not any other specific company. So far, the use of these white boxes has been largely been limited to giant cloud operators like Amazon and Alphabet. Most companies that don’t have in-house experts like them face the risk of problems with white boxes. If they bought proprietary hardware and software from Cisco, there’s a trained team ready to help in case of problems. But if they bought white boxes, they are on their own. Still, any time Amazon gets involved in something, it would be unwise to dismiss the threat. This is something to keep an eye on. Even after a nice run, Cisco stock still sports a forward PE around 15, quite a reasonable valuation compared those of its sexier peers. Of course, this is for a reason. Cisco simply isn’t growing nearly as fast. Despite better momentum, 2019 revenue is expected to only grow in the mid single digits. Still, in the world of tech, there are always new opportunities. Especially with the promise of more connectivity on the way, Cisco will have many opportunities to explore. There’s no guarantee that Cisco will emerge a winner, of course, but the company has been actively building relationships and preparing for 5G. As the largest networking company with the most comprehensive offerings, barring some serious missteps, Cisco is in a strong position. Even if Cisco remains what it is today, a slow-growing mature tech company, there’s still a place for it in a diversified investment portfolio. The company has a strong balance sheet and generates ample cash flow. For income investors seeking dividend growth, it’s a smart choice. Another smart choice would be to follow the investment advice of my colleague Jim Fink, who runs the premium trading advisory Velocity Trader. What if I told you that you could turn $5,000 into $255,000… in the next 12 months? That’s the promise Jim is making to his followers. Jim has developed a proprietary trading system that works in up or down markets, in good economic times or bad. Click here to learn more.